In January I wrote a review of "Metal Sky" also by Jay Caselberg. Turned out that was the second book in the series. 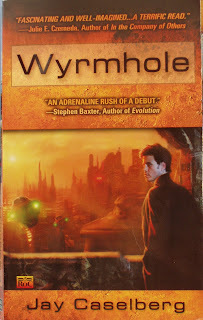 Was out shopping last weekend and came across "Wyrmhole" which is the first, so had to bring it home with me. This book fills in more of Jack Stein's history and how he became a Psychic Investigator and how Billie came to be his ward. Mr. Caselberg also describes more about the Locality and how it became home to thousands of people. Rather a neat concept, build a self contained system and the people will come. Never did tell me where the food comes from. As the city travels across the landscape it mines the materials it needs and builds 'new' at the leading end. At the same time, the tail end decays and is re-processed to help with the new constructions. Mr. Caselberg has the novel "Binary" posted on his website for free reading, though you are welcome to make a donation.